Five Shadows » Blog Archive » Gift Exchange Time! Progress! I finished the second quilting plan on Chic Country. I would like to make one more pass by quilting curved lines. For that, I’ll need to practice using a ruler while quilting. I’ve not mastered that yet – holding a ruler while moving the quilt. I’ll practice for a while and see if I can get the look I’m wanting. That said, I’ve set Chic Country aside for a bit as I work on making a few gifts for upcoming holiday gift exchanges. I’ve made 4 Be Merry quilties, inspired by this pillow. 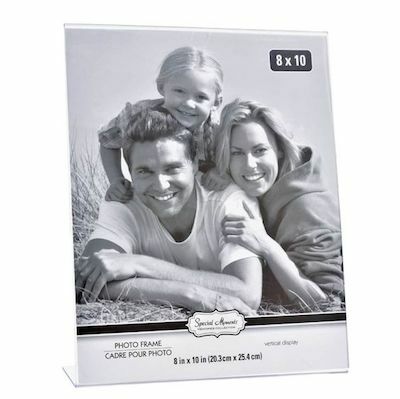 They are displayed on an 8″ x 10″ clear vertical photo frame like the one below. The little quilts slip over the frames. My daughter brought over the beautiful Poinsettia Thanksgiving Day, I just had to put it in the photo too! 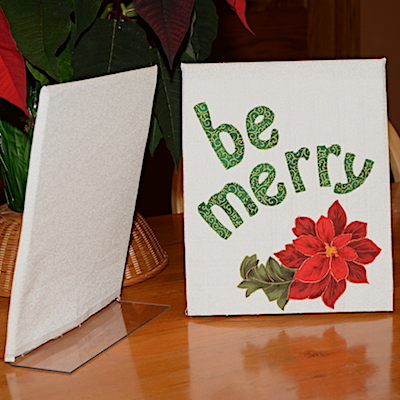 For the Be Merry quilts, I layered and quilted the background fabric, then fused the words and flowers in place. Then I stitched over the words and flowers in matching threads. I layered a back fabric with the finished top, right sides together, stitched the two sides and top, turned it right sides out, and then slipped the finished quilt over the photo frame. Earlier, I made snowmen tea-towels. 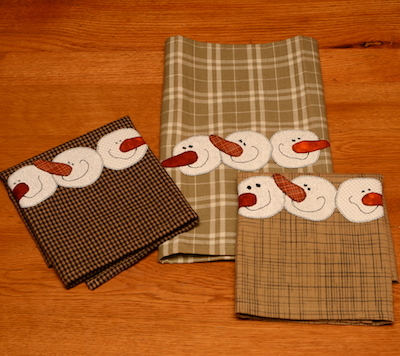 I bought ready made tea-towels and added the appliqué snowmen heads. I fused the heads and carrots in place, blanket stitched around them, and machine stitched the eyes and mouths in place. Next up will be making several fabric ornaments. I need to shop for fusible interfacing before starting those. Are you doing any holiday stitching? Side stepping again – finish up some little quilt gifts for gift exchange. This entry was posted on Tuesday, December 4th, 2018 at 19:46	and is filed under Quilting. You can follow any responses to this entry through the RSS 2.0 feed. You can skip to the end and leave a response. Pinging is currently not allowed. Those Be Merry mini quilts are so cute, and slipping them over that frame is genius! I love it! 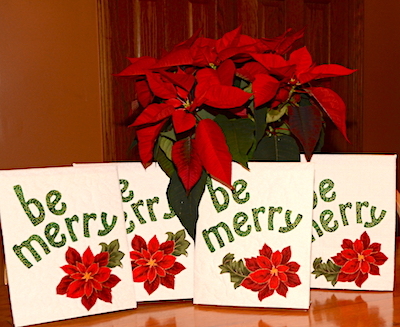 Poinsettia ended up being my theme for this Christmas and as a result I am loving on all things Poinsettia this year! 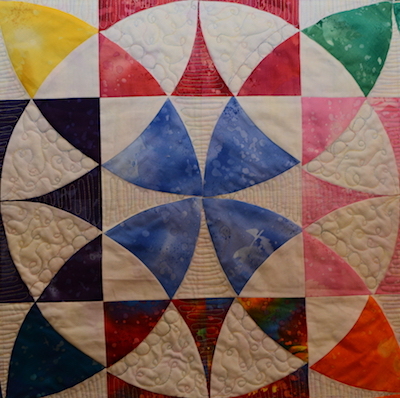 It is a real beauty – quilting and all! I have one made up in the same pattern from Batiks. I purchased a precut kit for it, which I never do, but apreciated having all those pieces lazer cut for me.